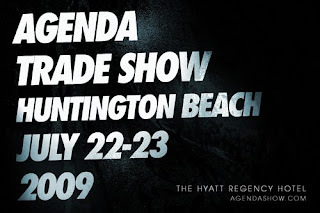 One of the main streetwear trade shows, Agenda, announced yesterday that "Agenda is relocating indefinitely from our long time home, San Diego to Huntington Beach, CA". The show will coincide with the U.S. Open of Surfing. This appears to be a step away from the streetwear driven mentality and a step towards the action sports industry (possibly sealing ASR's fate), as it will now correspond with the worlds largest action sports festival.